Modernism - Catalan Modernism and Barcelona Modernist buildings. Visitors to Barcelona can’t help hearing about modernism, modernist buildings and famous modernist architects Gaudí, Domènech i Montaner and Josep Puig i Cadafalch, but what is Barcelona modernist architecture and what does it represent? You would be forgiven for thinking that it means modern buildings or modern architecture, because it did mean that once, but for Barcelona modernism, it was over a century ago. What is now known as Barcelona’s modernist era ended around 100 years ago. 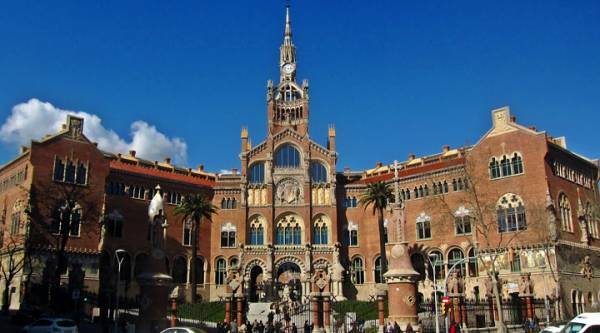 The Catalan modernism, also called 'Catalan Art Nouveau,' was an movement in architecture, art and literature movement that took place in Spain’s Catalonia region with Barcelona as the capital in the period from around 1885 and to 1920. As the name modernism indicates, the idea of modernism was to break with the both with the past in general and with the Spanish past to create a new different and modern style of living to suit the modern Catalan sense of nationhood identity. The modernist movement in Catalonia influenced all aspects of design and decorative arts to offer the wealthy emerging middle class a modern lifestyle that allowed them to live in a modernist way from top to bottom and morning to evening. Modernism influenced painting, sculpture, carpentry, forged iron, ceramic tiles, glass-making, silver and goldsmith work and also painting, literature and sculpture. Everything in the most famous modernist buildings from the doorknobs to the furniture to the roof chimneys was styled and crafted by modernist artisans. Even the toilets were modernist. Catalan modernism emerged as part of a general design trend in Europe. In other countries it has other names and styles, like Art Noveau in France. The style in Spain was different for various reasons. At this time Barcelona's medieval walls had been demolished and the city was expanding fast in the new Eixample area of Barcelona which was designed by Ildefons Cerdá following his design called the Cerdá plan. After the loss of the last important Spanish colonies like Cuba and The Philippines in 1898, wealthy Catalan industrialists were re-investing huge fortunes, that they had made in the Spanish empire, back into Spain. New fortunes were being made from the industrial revolution in Catalonia. Also at this time there was also a strong movement towards promoting Catalan identity and Catalan nationalists embraced the modernist movement as a way to showcase the difference between Spanish and Catalan culture. Modernism was a way for them to create something uniquely Catalan. All this encouraged the wealthy bourgeois class of Catalan factory and business owners in Barcelona to compete amongst themselves leave their mark on the city. This injection of wealth and support was the boost that the modernism movement in Catalan needed to create the distinctive and extravagent Catalan modernist style. The millionaires competed to see whose architect could create the most impressive, outrageous and innovative town houses, country houses and even tombstones in Barcelona's cemeteries. Architect Antoni Gaudí emerged victorious from the design contest. Gaudí would became the most famous of all the modernist architects, mostly for five of his modernist designs. For the Guell family Gaudí designed Park Guell and Palau Guell. For the Battlo and Mila families he created Casa Batllo and Casa Mila. To crown a life dedicated to modernism he designed Barcelona’s most famous church temple called La Sagrada Familia which became his masterpiece and a symbol of Barcelona and Catalan culture. Although Gaudí is now hailed as a genius, at the time ordinary Barcelona residents thought both the millionaires and their prized architects had gone mad. The neighbours petitioned to have Gaudí'sCasa Mila apartment block torn down, fearing the preposterous design would bring down property prices in neighbouring buidlings. Today we can thank Gaudí, the modernist designers and their patrons for leaving Barcelona a legacy that has made the city world famous. Barcelona's biggest modernist structure is not the Sagrada Familia, but the Hospital de la Santa Creu i Sant Pau (above) by Lluís Domènech i Montaner. It covers several blocks of the upper Eixample area of Barcelona. You can find it at the opposite end of the Gaudí Avenue from the Sagrada Familia temple. The economic depression of the thirties put an end to it all. The Spanish civil war from 1936 to 1939 ended with defeat for the Catalan region who has opposed fascist dictator Franco. Franco brutally suppressed the aspirations the Catalans had envisaged of independence and their own nation. Catalan modernism became old fashioned and fell out of favour and went unappreciated for the second half of the 20th century with the many iconic modernist buildings in Barcelona in decay. It was the transition to democracy, followed by the era of mass tourism, mass media and the 1992 Barcelona Olympics that shook the dust and grime off the modernism era. Suddenly Gaudí became world famous and today the modernist structures like the Sagrada familia temple and La Pedrera building by Gaudí and many other modernist buildings are symbols of the city. Today vistors can see many wonderful sights from the modernist era of Barcelona. Some are very famous but if you stroll around the Eixample area of Barcelona you will also find many unknown buildings with unique modernist design and features.